There is some dispute, in ecclesiastical circles, whether the kingdom of Yahweh, so often mentioned by Yahshua, is to be on earth or only in heaven. This is based chiefly on the use, only by Matthew, of the phrase the Kingdom of heaven. Because of this verse, some have argued that the kingdom must only be in heaven, being heaven itself as ruled by Almighty Yahweh. Neither Mark, Luke nor John refer to the kingdom of heaven, but only to the kingdom of Yahweh. Even Matthew uses as an equivalent phrase, the kingdom of Yahweh, four times at Matthew 6:33; 12:28; 21:31 & 21:43. In Matthew 13:43 & 26:29 Yahshua speaks of the kingdom of their Father and My Father’s kingdom. Both of these phrases obviously being equivalent to the kingdom of Yahweh. There is clearly no distinction between the kingdom of heaven and the kingdom of Yahweh. Then why were the two phrases used? These different phrases happened because outwardly pious Jews had first taken the name of Yahweh out of the scriptures, substituting the word adonai, meaning lord. This happened in the seventh century B.C. At least as early as 200 B.C., they had begun to substitute heaven for Yahweh. Even today, many Jewish publications won’t use the word God, writing it G-d. Funk and Wagnall’s New Standard Bible Dictionary says the following. So nothing can be based upon the use of the words kingdom of heaven. But what clues can we find in the Bible? First, Yahweh’s throne and kingdom are eternal. The following Bible verses all confirm where the kingdom of Yahweh is, on earth. Psalm 145:13: “Thy kingdom is an everlasting kingdom, and Thy dominion endureth throughout all generations.” An eternal kingdom on this earth was promised. We know Solomon never sat on the throne of Yahweh in heaven. We are told in the Bible that “Solomon sat on the throne of Yahweh as king”. Therefore Yahweh has an earthly throne, as well as a heavenly throne. It is prophesied that Yahshua shall sit upon the throne of the kingdom of Yahweh. It is quite definitely an earthly kingdom, and an eternal one. Psalm 47:2-7: “For Yahweh the Most High is terrible: He is a great king over all the earth: For Yahweh is the king of all the earth: sing ye praises with understanding. Yahweh reigneth over all the heathen.” This kingdom contains evil people, who must be rejected. Are there evil people in heaven? We are told the children of Satan are in the kingdom of heaven, and must be expelled. This can’t be in heaven. Matthew 13:37-43: “He that soweth the good seed is the Son of man. The field is the world; the good seed are the children of the kingdom; but the tares are the children of the wicked one: the enemy that sowed them is the devil; the harvest is the end of the age, and the reapers are the angels. 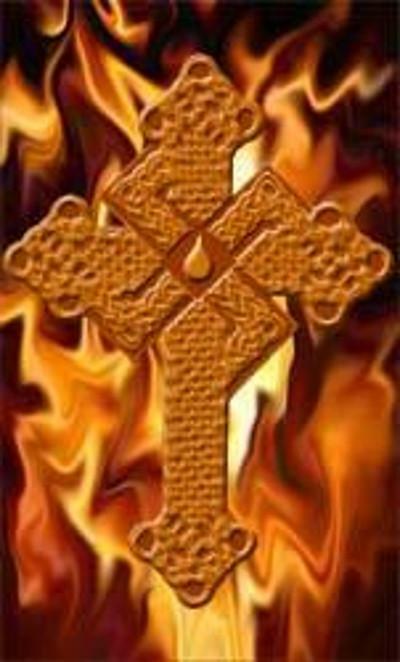 As therefore the tares are gathered and burned in the fire, so shall it be in the end of this world (order). The Son of man shall send forth His angels, and they shall gather out of the kingdom all things that offend and them which do iniquity.” This kingdom is one where people are material enough to eat and drink. The kingdom of heaven is the kingdom of Yahweh, and it is on earth. It contains both good and wicked people at present. Both good and bad people will be in the kingdom until the second coming of Yahshua, at this time the angels will cast out the wicked. The kingdom will be here forever and those in it won’t be merely spirits. They will be real and solid enough to eat and drink earthly meals. It is the kingdom of heaven, but it is not in heaven. Critical note by Clifton A. Emahiser: This has to be one of the better presentations Bertrand L. Comparet ever gave! Off hand, I would place it among his TOP TEN. I find little with which to disagree, but much to concur! Therefore, I will add some of my own observations. In this lesson, Comparet cited Daniel 2:44 thusly: “Daniel 2:44: ‘And in the days of these kings shall the God of heaven set up a kingdom which shall never be destroyed: and the kingdom shall not be left to other people, but it will break in pieces and consume all these kingdoms, and it shall stand forever’.” If ever Comparet turned out a masterpiece it was his Daniel’s Fifth Kingdom which would also rate among his TOP TEN. For the first four kingdoms of Nebuchadnezzar’s dream-vision the futurists use an historical view. Then, without any good reason, they suddenly switch to a futurist view which is hardly consistent. At that point they skip ahead nearly 2000 years and declare that Christ will set up His kingdom then. It was to be Christ’s Kingdom all right, but it was the Germanic (Scythian Israelite) tribes that crushed the ten toes (provinces) of the Roman empire. Therefore, the German tribes represented the “kingdom” which Daniel prophesied would “stand for ever”. That kingdom is already here, and has been for centuries, and when Yahshua Christ returns at his Second Advent, He will be crowned King!